These are a very simple-to-assemble recipe. Loved the olives and hummus together & my guests enjoyed it too. 1. In a food processor, combine chickpeas, 1/4 cup oil, lemon juice, and garlic. Blend to make smooth paste. Season with salt and pepper and set aside. 2. 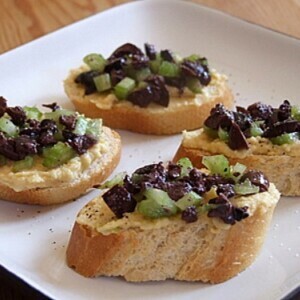 In small bowl, combine 1 T. oil, olives and celery. Season with salt and pepper and set aside. 3. 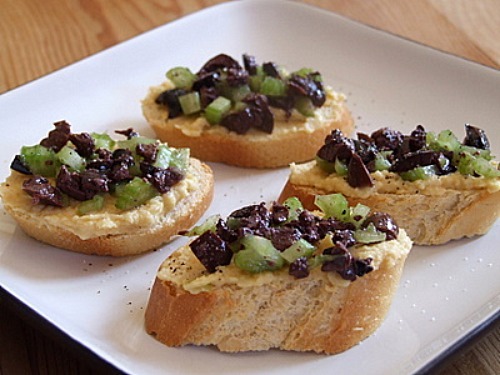 Spread chickpeas mixture among the baguette slices, and top with olive mixture. Season with freshly ground pepper. *A good olive oil can sometimes make all the difference! *Toast the baguette slices briefly under the broiler (before topping with chickpea mixture) if you prefer a toasted baguette.